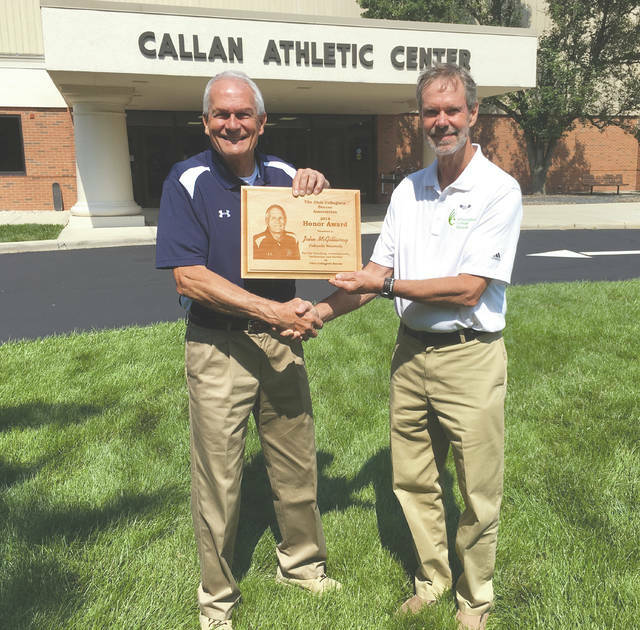 Longtime Cedarville University men’s and women’s soccer coach John McGillivray (left) was presented with the 2018 Honor Award from the Ohio Collegiate Soccer Association on Sept.4 in Cedarville. Making the presentation was longtime friend and OCSA Executive Committee member Bud Lewis, who just wrapped up a 43-year career coaching the men’s soccer program at Wilmington College. The Honor Award is the OCSA’s highest honor recognizing coaching, achievements, dedication and service to Ohio Collegiate Soccer. McGillivray was the Yellow Jackets men’s coach for 24 years, and the women’s coach for 18, in a storied 42-year career at Cedarville University. https://www.fairborndailyherald.com/wp-content/uploads/sites/50/2018/09/web1_McGillivrayLewis_PS.jpgLongtime Cedarville University men’s and women’s soccer coach John McGillivray (left) was presented with the 2018 Honor Award from the Ohio Collegiate Soccer Association on Sept.4 in Cedarville. Making the presentation was longtime friend and OCSA Executive Committee member Bud Lewis, who just wrapped up a 43-year career coaching the men’s soccer program at Wilmington College. The Honor Award is the OCSA’s highest honor recognizing coaching, achievements, dedication and service to Ohio Collegiate Soccer. McGillivray was the Yellow Jackets men’s coach for 24 years, and the women’s coach for 18, in a storied 42-year career at Cedarville University. Submitted photo.